Summit Business Media has sold Highline Data, its insurance information services unit, to SNL Financial LC. DeSilva+Phillips Mediabankers client, Summit Business Media, has sold its Highline Data, it’s insurance information services unit, to SNL Financial LC. The acquisition bolsters SNL’s position as the leading U.S. insurance financial information provider across the property & casualty, health and life insurance sectors. With more than twenty years as an industry leader, Highline Data brings a wealth of history and proven experience to SNL Insurance’s existing offerings. 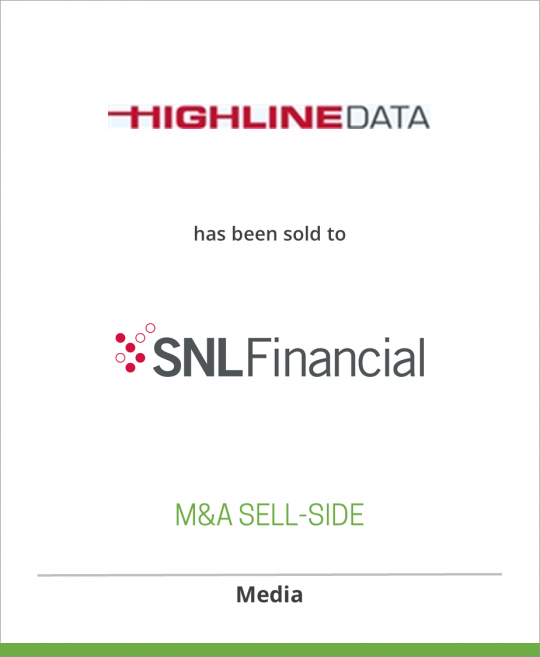 As part of the acquisition, Highline Data’s clients will now have the ability to access SNL’s robust financial institutions database with detailed profiles on more than 20,000 U.S. financial institutions, including banks & thrifts, broker/dealers, investment companies and mortgage lenders. At the same time, Summit will retain long-term access to the same insurance industry financial data and analysis previously available through Highline Data for use in its own products and services. The sale of Highline Data will have no impact on Summit’s Marketing Data Group, including Judy Diamond, Agent Media and Kirschners. “As a primary redistributor of U.S. regulatory insurance data, Highline Data provides valuable information on the strength of the insurance industry and of individual companies to the industry itself, as well as to analysts and investors, making it a natural fit within SNL’s best-in-class information franchise,” said Andrew L. Goodenough, President & CEO of Summit. DeSilva + Philips acted as financial advisor for Summit and SNR Denton was legal advisor. BMO Capital Markets acted as financial advisor for SNL and Dennis Rooker, PC was legal advisor. Terms of the transaction were not disclosed. SNL Financial is a leading provider of financial information on more than 3,300 public companies and 50,000 private companies in the business sectors critical to the global economy: Banking, Financial Services, Insurance, Real Estate, Energy and Media & Communications. The SNL information service integrates breaking news, comprehensive data and expert analysis into an electronic database available online and updated around the clock. SNL’s statutory data includes detailed financial data on each filer, reinsurance, investment and loss reserve schedules, data by state and line of business and hundreds of ratios, snapshots and analytics, available exclusively as part of SNL Unlimited service for Financial Institutions. SNL is the only information provider to offer clients a comprehensive insurance product, linking statutory data with public company data, mergers & acquisitions data, proprietary news, documents and more. To find out more about SNL Unlimited, contact sales@snl.com or call +1.866.296.3743.